Prev Slurs and Hate Speech: The Joke Isn’t Funny Anymore Next Stop Hitting Your Sister! Gearing up for college: Dining while dormed? I got such a great question over at Want Not the other day, I decided to answer it here, as it fits right in with a lot of the other “impending college” stuff we’ve been talking about lately. Have you written about selecting college meal plans? We are close to having that quandary er… privilege. Son in question is a quesocarbotarian if we don’t keep an eye on him. He’s been vegetarian for close to 10 years, he easily eats veggies, fruits and plant proteins lovingly placed on the table before him, but I fear he may have difficulty finding balanced food court style choices. And how do you select an appropriate number of meals per term? We do have Amazon Prime for any emergencies. If you have sage advice (and you surely do!) I bet lots of folks would love to know how you broke this down? Let me begin by noting that “quesocarbotarian” made me laugh out loud, because hey, I have one of those, too! Everything here sounds very, very familiar. There is no one-size-fits-all solution, but allow me to propose the questions you should consider to bring you closer to the right answer for your particular college student. What are the freshman meal plan purchase requirements? Start with what the college requires, because nearly every college requires that freshmen living on campus must purchase a meal plan. (Whether this is out of concern for your student or a desire to line their pockets… is a different discussion.) At some schools, the requirement is that the student have an “unlimited” plan the first year, and that leaves you with no choices and you’re done. Other schools require a plan, but allow some flexibility as to how many meals you have to buy. If you have options, read on. Are there reasonable food choices available for your student? This one is a little bit less straightforward; theoretically, every college dining hall offers a variety of food. But at a large university there are both more choices per dining facility and more facilities from which to choose, whereas a smaller school might have a single dining facility without a lot of choices. Add in any sort of food preference or allergy, and you could be looking at a situation where you suspect your student will opt for the same one or two foods over and over. This is a good place to assess needs vs. wants; some kids have life-threatening allergies (in which case please speak with someone in Food Services about how they handle such issues), some kids have dietary preferences (like being a vegetarian), and some are just picky. Talk together about what you honestly see happening once your kid is off at school. The reality is that plenty of non-dietary-restricted kids go off to college and subsist on pizza and nachos and live to tell the tale. It’s not ideal, and it’s not good nutrition, but some kids are perfectly happy that way. What’s your student’s natural eating schedule? Left to her own devices, my current college student would never eat breakfast. Never. Again, that’s not optimal, but it is what it is, and so given the option to buy her a 14-meal-a-week plan, that’s what we did. On the other hand, my son will be heading off to college in August, and he is a breakfast-eater. (He also doesn’t have a lot of the food limitations his sister does.) We’ll probably get him an unlimited plan, to start, and then see how much he’s using it the first semester before we decide what to do thereafter. What are the available meal plans, including “perks,” and what can you afford? Different schools have different options, and while all offer an “unlimited” plan, after that your choices may vary. You may be able to buy meals per week, per month, or even per semester. Nowadays meal plans tend to come with some associated amount of “dining dollars” which is money placed into a student account linked to their ID card which can then be used at “partner” eateries (usually elsewhere on campus). Sometimes plans with fewer meals cost less but come with more of those dining dollars, which—again, depending on the available options—may be a better bargain for your particular student. Make sure you check both where that money can be used and whether or not unused dollars roll over to the next semester or expire, when doing your calculations. A note on price, here: On the one hand, you don’t want to spend money you can’t afford, and it is absolutely true that unlimited dining plans are really only a “bargain” if your kid is a big eater. For most of us, an unlimited or high-meal plan is not a particularly good deal, food-wise. 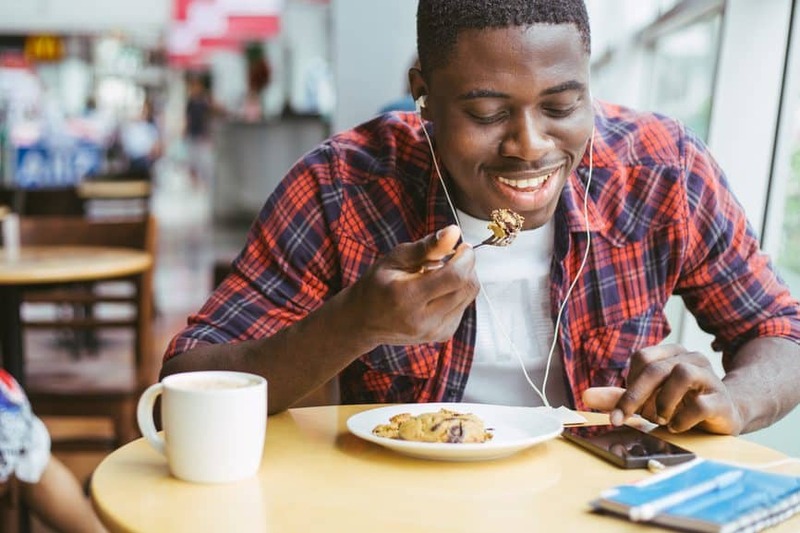 What it is—provided your student actually uses it—is peace of mind, knowing that food is always available to them, and also a lot of socialization happens in the college dining halls, particularly for freshmen who are finding their way. Once you’ve answered all of the aforementioned questions, you should have a pretty good sense of what meal plan to buy for the first semester of college. Err on the side of more, if you can afford to. Again, you’re not buying food so much as peace of mind—even if they’re broke, kids with meal plans can still go eat! Make peace with the fact that yes, your quesocarbotarian (still makes me laugh!) may skip the fruits and veggies most or even all of the time. That’s his choice and he will live. Pack him some multivitamins and feed him some nutritious homemade meals when he’s home on break. Figure out what good “dorm food” options are for him, and that means “things he will genuinely eat” rather than “things you wish he would eat.” I give my kid homemade multigrain muffins to take back to school every time she’s home, but I also keep her stocked in Pop-Tarts, because, well, she eats them. I mail her hummus and pita chips but I also buy her Easy-Mac cups, which barely counts as food. You get the idea. I make sure she has protein bars and those little cups of fruit in fruit juice (not as good as fresh, but better than nothing, and shelf-stable is key in a dorm room) and remind her to pick up yogurt and cheese for her mini-fridge. My daughter’s freshman year in college is almost over, and that means we can pick a smaller meal plan next year than she was “allowed” to have this year. Now that I know she’s not wild about the dining hall food, we’ll be getting her a “block” plan (a set number of meals for the semester) and adding extra money to her dining dollars (because the partner eateries are places she likes better than the dining hall). This is not a kid who wants to cook, so this works out for her. I see my son eating at the dining hall his first and maybe second year, and then probably moving into an apartment and cooking some of his own meals. We’ll just see how it goes. Good luck, and congratulations to your son on his upcoming adventure! It’s been a very long time since my uni days, but nothing appears to have changed in terms of meal plans! I went for a middle of the road plan (UWAterloo, Canada), and it fed me and my boyfriend (shh, don’t tell mom) for two semesters, and I had money left over at the end of the year that I had to spend before I moved off campus. It also came in handy during project work and group study sessions, as I could treat everyone to a coffee and muffin in the dining hall, even if they weren’t on meal plans. As a relatively recent college grad (2009 – OK not so recent..) I rarely ate in the dining hall. I just didn’t care for the food. I believe I had the smallest plan at the time. My college, however, had an after-hours ‘store’ where you could spend your unused meals on junk food and sandwiches – which I did! Now, if I had to start over again, I wouldn’t eat in the dining hall due to celiac disease. I can’t imagine how well that kind of operation can deal with cross-contamination..